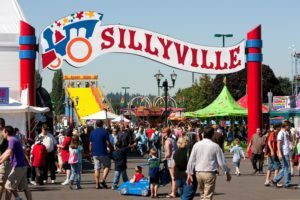 The Washington State Fair does have a lot of activities for the kids. Also, if you child is under 5 – they get info the fair for free! Discover the Dinosaurs is a walk-through exhibit designed to bring you back in time to a landscape where dinosaurs lived. See a variety of different dinosaurs and be amazed these creatures once roamed the earth! See the pumpkins, corn, squash and more at the Planting Patch located near SillyVille and the Fair Farm. The fair can teach your kids about agriculture! They will enjoy learning about what comes from the earth and how we grow the food we eat! Your kids will love SillyVille. Ride the train, pay a visit to the Food Court and Soda Shoppe featuring kids value menu items (sized just right for small appetites), rides, free face painting, and more! A demonstration of small-scale farming and gardening in small spaces. Locally-made farm and garden products are on display. After learning about farming and gardening, your kids can view a larger farming veggie and fruit display. Kids will jump at the chance to test their driving skills on a pedal tractor. When driving the test track, they will go through a farm and over a river! This activity is Free with Fair admission (also a very cute picture opportunity). A Fireworks show is held every Friday night at 10 pm at the fair. Even though it is a late event, your kids are sure to be dazzled by the sky lighting up. It’s a great way to wrap up a fun day at the fair. An interactive activity where youngins can learn about the aspects of country life like saddling a horse, roping a steer, milking a cow and other various hands-on activities.